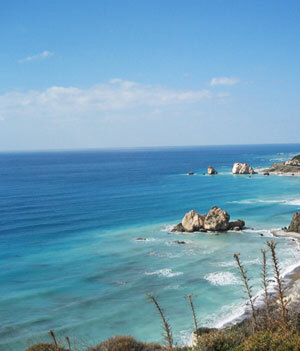 Apart from being one of Britain’s most popular overseas property destination, Cyprus is also the only place in Europe to guarantee sunshine all year round. In just over four hours you can escape the cold, wet, British winter, as I did, and stay in one of the numerous boutique/spa hotels that seemed to have mushroomed all over the island in the last few years. If de-stressing and sunbathing is your ideal holiday, or even a game of golf, then this is the perfect getaway retreat for you. Choose any one from the following and make your trip a true escape of indulgence. 1 According to Greek mythology, Cyprus gave birth to Aphrodite, Goddess of Love who supposedly rose from the sea to seduce and captivate the world. Her birthplace is one of the beauty spots of the island and minutes away is the Intercontinental Aphrodite Hills Resort Hotel. Set high up amongst carob and olive groves the views are stunning and you will be sure to witness the best sunsets on Cyprus. The resort also has in my opinion one of the best spas on the island. The Retreat not only offers wonderful treatments, performed by experienced, expert, therapist, it’s also architecturally beautiful. Surrounded by lush gardens treatments take place in the summer months in the open air. Also if golf is your passion then look no further than Aphrodites Hills. With the blue of the Mediterranean as your back drop, the resort is divided by a dramatic ravine and it’s an 18- hole championship course which is both visually breathtaking and challenging. 3 The Columbia Beach Resort in Pissuri Bay is modeled on a traditional Cypriot village, using indigenous stone and maintaining the low-key tones and colours of the landscape. The resort comprises 94 deluxe suites all exquisitely furnished and styled, with cafés and restaurants dotted around the grounds in an open-air piazza. Although the Columbia is secluded and hidden away in it’s own little cove it’s also within a few minutes walk to the rest of Pissouri Bay, which itself is a mini tourist resort, complete with tavernas, bars, cafés and shops. Its superb spa centre offers many treatments aimed at body and mind well-being, performed with nurturing care by the spa’s staff. Once in the treatment room you feel totally indulged and cared for and time seems to stand still. Nobody keeps an eye on the clock and the treatment is not over until the required effect is achieved. The effect of my distressing back massage lasted much longer than any I had before and longed for another one once back in London. 4 Just a few miles down the road in down-town Paphos you will find the newly refurbished Almyra hotel. Almyra means, ‘the taste of the sea’ and since it’s built right on the beach, that is exactly what you get. Inside, the style is modern-chic and minimal, feeling more like a trendy New York or Parisian hotel than a sea side resort. Glance out of any window though and all you see is an uninterrupted sea-scape. The brand new AlmyraSpa has a range of treatment rooms, two spa suites with water therapy and an outside deck for yoga. The children’s facilities are also brilliant. Special features include the inspired ‘Baby Go Lightly’ programme, whereby everything a traveling baby might need can be pre-booked from sterilizers, Pampers nappies and child pushchairs to storybooks. 5 Outside Paphos, along the coast road past the Tombs of the Kings, one of the most famous archaeological sites on the island you will find the boutique hotel and Spa, Thalassa. Built on the tip of a cape, and between two bays the views that surround the Thalassa are pure oceanic. Blue, blue and more blue. This deluxe 58 bedroom hotel proudly claims to have developed a new service concept, the first on the island which offers a personal butler to every Superior Suite. However unlike the Almyra which has a child friendly philosophy Thalassa doesn’t extend its hospitality to any one under the age of 12 making your stay there a true escape. 6 Overlooking what must be the most beautiful bay on the island is The Anassa. Situated in the Paphos area, north west of Cyprus, in a secluded bay and beach, The Anassa has as it’s back drop the mountains and forest of the Akamas National Park. The hotels rooms are dotted around it’s grounds making it feel more like a luxury village than a hotel. The Roman style spa is set in the hotels fragrant gardens and is as luxurious and opulent as it’s style implies, with one of the most beautiful indoor swimming pools I have ever seen. As well as visiting the nearby small town of Polis, discover the unspoiled and wild beauty of the Akamas peninsula, a protected nature reserve which you can either walk or drive around. Venture further into places like Lara Bay, where turtles come to lay their eggs every year, and come across remote monasteries, sleepy villages and ancient archaeological sites. If, however, what you’re looking for is to get out and explore, then Cyprus, with its thousands of years of history and culture, is also the perfect place for you. Not only does the island combine beautiful beaches with an ever-changing landscape, but in the summer you can go from a scorching beach to a cool restaurant in the Troodos mountains, where you’ll find delicious local food, in a couple of hours. And in the winter you can exchange your swimwear for ski wear and drive up to the snow peaks. Nicosia, the island’s capital, also has an ancient history, going back to the Bronze Age, and the old town is enclosed by an intact sixteenth-century Venetian wall. The many conquerors who have passed through Cyprus have left their mark and cultural influences behind; standing in the centre of the old town, amongst Orthodox churches and minarets, with palm trees silhouetted in the evening sky and smelling the jasmine scented air, you’re very much aware that this really is the edge of Europe. Here East meets West and you’re at the gateway to three continents – Africa, Asia and Europe.